The final trailer for A Quiet Place is here. Mainstream horror has had an amazing resurgence, in terms of both box office and quality, in recent years. That's been great for studios and moviegoers alike and, hopefully, 2018 can keep the trend going. If this latest trailer for A Quiet Place is any indication, this movie certainly could be the first mainstream horror success story of the year, as this new footage is terrifying and compelling. Paramount has been quite secretive in regards to the details with A Quiet Place. The trailers have kept the meat of the plot hidden and they've certainly been shy about showing the monsters at the center of the terror in the movie. Mostly, they've leaned heavily on the premise, that those who are alive in this mysterious, post-apocalyptic world must stay absolutely silent or risk certain death. That said, this new trailer, though brief, reveals quite a bit more of what's in store for moviegoers. So, if you're already planning on seeing the movie and like the idea of going in blind, maybe avoid the trailer. On the flipside, if you still need a little more convincing, this trailer may just do the trick. Aside from the new footage, which gives our best look at the killer creatures yet, this new A Quiet Place trailer leans heavily on the critical praise the horror flick has earned thus far. Since its debut during this year's SXSW festival in Austin, Texas, A Quiet Place has garnered a great deal of buzz. The horror/thriller currently sits at a perfect 100 percent approval rating on Rotten Tomatoes, with 38 reviews counted as of this writing. That perfect score is likely to be tarnished at some point, but people love this movie so far and it's poised to be a possible hit for Paramount. John Krasinski makes the jump to big-budget feature directing with A Quiet Place. People have loved the actor ever since his early days as Jim Halpert on The Office, but he is turning over a new leaf here. Not only does he direct the movie, but he also stars alongside his real-life wife Emily Blunt in a totally different genre than we're used to seeing him in. If this movie can find success at the box office to go along with the critical praise, Krasinski may be in line for some major directing jobs in the very near future. The question is, can A Quiet Place find that success? It's going to be a crowded weekend at the box office, with Steven Spielberg's Ready Player One entering its second weekend and Universal's comedy Blockers, which also debuted with praise during SXSW, also coming out this weekend. Additionally, Wes Anderson's Isle of Dogs is expanding nationwide. 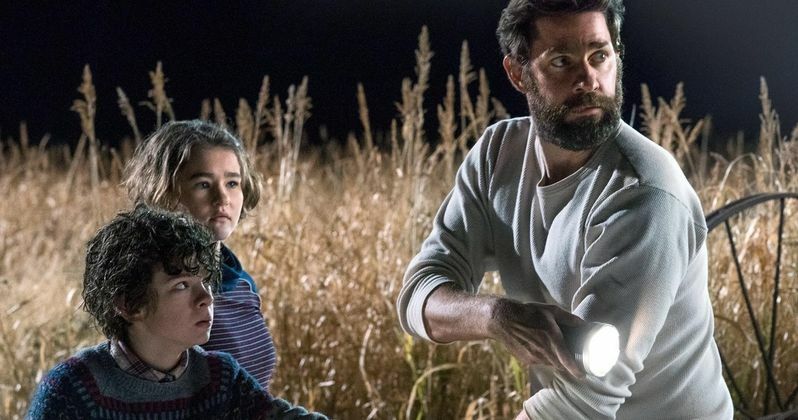 Hopefully, the praise will be enough to help A Quiet Place as it cuts through the noise. Be sure to check out the final trailer for the movie, courtesy of the Paramount Pictures YouTube channel, for yourself below.